Digitalis (Foxgloves) are biennial, meaning they take one year to grow the leaves and then flower, set seed and die by the end of the second year. If you sow the seeds early enough in the year then you might be able to get them to do all of that in one year but it’s not guaranteed – especially if the weather is bad (like it has been this year). About this time last year, I sowed a whole batch of foxgloves and we’re benefitting from those now and so it’s time to repeat the cycle, sowing a fresh batch of foxgloves from the seeds taken from last year’s plants now, to replace the current foxgloves when they set seed and die this autumn. 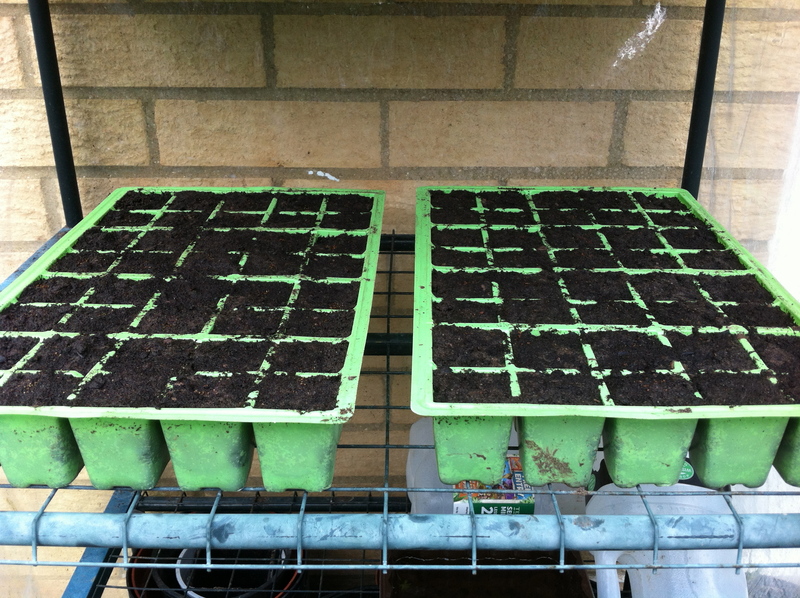 If I remember correctly, the tray on the right is from salmon pink coloured foxgloves while the tray on the left is from a packet of seeds – the “Excelsior” hybrid – mixed colours. I’ve grown them in these modules for convenience. As the seeds are so small, I’ve had to just sprinkle them on, but don’t be too liberal as they germinate readily. Later on I’ll thin them to one or two plants per station. Along with this are a half a tray of Lunaria (Honesty) and a tray of lupins of various colours too. I’m going to have to find space for all these plants somewhere!